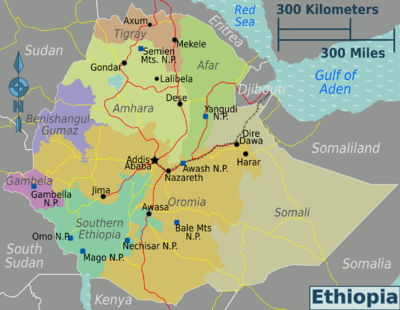 Ethiopia (Amharic: ኢትዮጵያ ʾĪtyōṗṗyā) is a fascinating country in the Horn of Africa and the second-most populous nation on the African continent (after Nigeria). It's bordered by Eritrea to the north, Djibouti to the northeast, Somalia to the east, Kenya to the south, and Sudan and South Sudan to the west. Ethiopia is the oldest independent country in Africa and the second-oldest official Christian nation in the world after Armenia. Ethiopia is also the place for the first Hijrah (615 AD) in Islamic history where the Christian king of Ethiopia accepted Muslim refugees from Mecca sent by the prophet Mohamed. Along with Liberia and Darwiish State, it was the only nation to survive the Scramble for Africa. Ethiopia is one of the oldest countries in the world. In the long and disturbed history of the African continent, Ethiopia remains the only country which has never been colonised (except for a brief occupation by Italy during World War II). Ethiopia was a founding member of the AU and is home to the African Union's headquarters. The Old Testament of the Bible records the Queen of Sheba's visit to Jerusalem. In fact, historians believe that Ethiopia may well be the beginning of humankind. The fossils of the oldest once-living humans or "Lucy" were discovered in the the northern section of Ethiopia. The remains of the fossil are said to be 3.5 million years old. After a long and difficult period under self-declared communist rulers, the country is now back on its feet. The long history assures that there are many historic sites in the country. The natural beauty, with high mountains, lakes, waterfalls as well as arid deserts are among the natural attractions of Ethiopia. 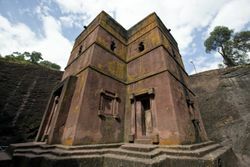 Highlights in Ethiopia include the towns of Axum, Gondar, Harar, as well as the rock churches of Lalibela and Gheralta. Spectacular outdoor activities are rafting on the Omo River. And several national Parks offer gold opportunities for multi-day hiking in spectacular landscape, partly with good chances to spot wildlife animals. The Danakil Depression is one of few places worldwide where one can descent to an active vulcano's lava flow. Ethiopia is one of the oldest nations in the world. It has long been an intersection between the civilizations of North Africa, the Middle East and Sub-Saharan Africa. Ethiopia was never colonised, maintaining its independence during the "scramble for Africa" until the Italian military occupation which was achieved through the use of mustard gas, Italian and colonial manpower, and superior firepower during the buildup to World War II. During this period, the Italians merged the country with Eritrea and Italian Somaliland to form Italian East Africa and despite continued guerilla attacks, Abyssinia (as Ethiopia was called then) was not able to relinquish itself of Italian control until the allies pushed them out with the help of colonial troops. Ethiopia has long been a member of international organizations: it became a member of the League of Nations, signed the Declaration by United Nations in 1945, founded the UN headquarters in Africa, was one of the 51 original members of the UN, and is the headquarters for and one of the founding members of the former OAU and current AU. In 1974, its monarchy was deposed, and replaced with a pro-Soviet military junta, which ruled Ethiopia for 17 years until the end of the Cold War. Ethiopia was historically called Abyssinia. The predominant climate type is tropical monsoon, with wide topographic-induced variations. As a highland country, Ethiopia has a climate which is generally considerably cooler than other regions at similar proximity to the Equator. Most of the country's major cities are located at elevations of around 2,000-2,500 metres (6,600-8,200 ft) above sea level, including historic capitals such as Gondar and Axum. The modern capital, Addis Ababa, is situated in the foothills of Mount Entoto at an elevation of around 2,400 metres (8,000 ft), and experiences a healthy and pleasant climate year-round. With such temperatures, the seasons in Addis Ababa are largely defined by rainfall, a dry season from October to February, a light rainy season from March to May, and a heavy rainy season from June to September. The average annual rainfall is around 1200mm (47 in). There are on average 7 hours of sunshine per day, meaning it is sunny for around 60% of the available time. The dry season is the sunniest time of the year, though even at the height of the rainy season in July and August there are still usually several hours per day of bright sunshine. The average annual temperature in Addis Ababa is 16°C (61°F), with daily maximum temperatures averaging 20-25°C (68-77°F) throughout the year, and overnight lows averaging 5-10°C (41-50°F). A light jacket is recommended for the evenings, though many Ethiopians prefer to dress conservatively and will wear a light jacket even during the day. Most major cities and tourist sites in Ethiopia lie at a similar elevation to Addis Ababa and have comparable climates, though in less elevated regions, particularly the lower lying regions in the east of the country, the climate can be significantly hotter and drier. The town of Dallol, in the Danakil Depression in this eastern zone, has the world's highest average annual temperature of 34°C (93°F). A high plateau with a central mountain range divided by the Great Rift Valley, arid low lands in the east and lush riverine lowlands in the westernmost parts. The still geologically active Great Rift Valley is susceptible to earthquakes and volcanic eruptions. Frequent droughts and unrestricted fecundity threaten periodic famines. Ethiopia is now landlocked since the entire coastline along the Red Sea was lost with the de jure independence of Eritrea on 24 May 1993 after years of bitter fighting. The Blue Nile, the chief headstream of the Nile, rises in T'ana Hayk (Lake Tana) in northwest Ethiopia. Three major crops are believed to have originated in Ethiopia: coffee, grain sorghum, and castor bean. Teff is also a grain that came from Ethiopia. Ethiopia uses the Ethiopian calendar, which dates back to the Coptic calendar 25 BC, and never adopted the Julian or Gregorian reforms. One Ethiopian year consists of twelve months, each lasting thirty days, plus a thirteenth month of five or six days (hence the "Thirteen Months of Sunshine" tourism slogan). The Ethiopian new year begins on 11 or 12 September (in the Gregorian calendar), and has accumulated 7-8 years lag behind the Gregorian calendar: thus, for the first nine months of 2007, the year will be 1999 according to the Ethiopian calendar. On 11 September 2007, Ethiopia celebrated New Year's Day (Enkutatesh) for 2000. In Ethiopia, the 12-hour clock cycles do not begin at midnight and noon, but instead are offset six hours. Thus, Ethiopians refer to midnight (or noon) as 6 o'clock. Airline timetables and our guides (unless otherwise stated) are based on the 24-hour clock and use the Gregorian calendar. Ethiopia is ranked with the other African countries of Kenya, South Africa, Tanzania and Zambia for preserving and maintaining national parks as tourist attractions. The southern and south-western part of the country has a stunning natural beauty with a huge potential of becoming a unique resort. Most visitors to Ethiopia require a visa. Nationals of Djibouti may enter visa-free for up to 3 months, and nationals of Kenya may enter visa-free for up to 1 year. Ethiopia have recently announced visa on arrival for all nationals of African nations from the 1st of November 2018. Nationals and permanent residents of Argentina, Australia, Austria, Belgium, Brazil, Canada, China (PRC), Czech Republic, Denmark, Finland, France, Germany, Greece, Hong Kong, India, Ireland, Israel, Italy, Japan, Kuwait, Luxembourg, Macau, Mexico, Netherlands, New Zealand, North Korea, Norway, Poland, Portugal, Russia, Slovakia, South Africa, South Korea, Spain, Sweden, Switzerland, Taiwan, Thailand, the United Kingdom and the United States may obtain a visa (valid for up to three months) on arrival at Addis Ababa Bole International Airport, provided that they are not of Eritrean or Somali origin and do not hold Pakistani nationality. The fees for single entry visa-upon-arrival is USD50 for one month (€44 in March 2018: I paid €45 for my one-month visa and was given one €1 coin change), or USD70 for three months, regardless of whether one is applying for a tourist, business or transit visa. A photography will be taken at the counter where you first show your passport; then, the clerk will place a sticker, where your details will be written, and you'll be asked to go to the booth behind, where payments are done. International transit without staying overnight will be visa-free, or you may request a free transit visa card from the interline counter on arrival at Addis Ababa Bole Airport if you are transiting between terminals 1 and 2. The procedure is relatively quick and painless; just look for a door with a "Visa" sign on the left hand before the immigration counters. Multiple entry visas are only issued with prior approval from Ethiopian Ministry of Foreign Affairs. IMPORTANT: As of April 2018, the authorities insist that you must tell them your intended place of residence and contact number before issuing visas. Nothing appears to be checked, so in practice any hotel address and phone number should suffice. However, as long as you're unable to provide some address and phone number, they refuse to process the visa documents. All other nationals, in addition to travellers from the above specified nations who do not intend to enter Ethiopia through Bole Airport, will require a visa beforehand. Overland travellers coming from Sudan can easily obtain a visa in the Ethiopian Embassy in Khartoum. A filled in form, a passport copy (available for S£6 at the embassy) and 2 passport photos dropped in the morning is often enough to get the visa in about an hour. A 30 day visa costs $40, a 3 month visa $60 (February 2016). Obtaining a visa at Tel Aviv embassy is also very easy; it takes around 15 minutes and costs NIS100 for a 1 month visa and NIS150 for a 3 month visa. You can request a multiple entry visa at the same price if needed. The embassy in London for UK citizens obtaining a visa is on Princes Gate opposite Hyde Park. Really simple. Hand in your papers and cash and come back in 2 or 3 hoursIt's advised to bring the exact money. Ethiopian Airlines (IATA code ET) is the sole domestic airline operator and one of the most successful and reputable airlines in Africa and is a Star Alliance member, servicing both the USA and Europe with direct flights. Bole International Airport in Addis Ababa is the main hub for Ethiopian Airlines with flights to most capitals of Africa. An extremely attractive deal for ET passengers on their way to other East Africa safari destinations is to make a week stop-over in Ethiopia at no additional cost to enjoy the famous Ethiopia Historical Circuit before flying to their final destination. Other international airlines serviced by Bole International Airport include: Lufthansa, Sudan Airways, Kenya Airways, British Airways, KLM, Turkish Airways, Emirates, Gulf Air, Egypt Air and Fly Dubai. A new runway and international terminal, which was said to be the largest in Africa, opened in 2003. Many hotels will offer free pickup - be sure to book in advance. If not, upon arrival you may call your hotel for the transfer but may wait up to 1 hour depending on the traffic. One way to get in from Sudan is via the border village of Metema. One way to get in from Kenya is via the border town of Moyale. The road from Kenya to Ethiopia through the town of Moyale is much better and well maintained. On the Kenyan side of Moyale the road is well done with tarmac all the way from Nairobi to Moyale, at least 9 hrs hours, to travel from Moyale to Nairobi. Though not advisable for foreigners, bush taxis oftentimes ferry people between Hargeisa and Jijiga, though it will be necessary to change busses at the border between Somaliland and Ethiopia. Public transportation brings you to the border. To/from Sudan or Kenya you just walk to the other side. If you arrive at the border towns late at night, try not to cross the border in the dark. Wait in the town and do your travelling in the morning. Buses that cover some distance start in early morning. This implies that if you arrive during the day you would be stuck at least until the next morning. From Djibouti you can take a small bus to the border (2-3h) where you will find buses to Dire Dawa. This road is a dirt track and the trip takes at least half a day, at nightfall the bus stops and you resume travel the next day. From Ethiopia into Djibouti, a bus leaves supposedly around midnight (buy tickets during the day at the office in the centre of Dire Dawa). This arrives at the Djibouti border in the morning where you change onto a different bus to get to Djibouti City. It is a good idea to take a tuk-tuk (auto-rickshaw) to the bus station as hyenas wander the streets of Dire Dawa at night. From Khartoum, Sudan. There is an easy and comfortable route possible entirely by public bus. Take a microbus (5SDG) from any of the Khartoum bus stations to Mina Bahri (N15.527495, E32.543703). Pay 3SDG entry to the terminal, walk inside the terminal building and ask for Al Gadaref at one of the ticket windows. Once you have your ticket (100SDG) confirm the bay number and departure time. The ticket seller will then direct you to a government office where you must provide a photocopy of your passport photo and visa pages and pay 20SDG to have your ticket stamped with permission to travel. The standard permit to travel is not required on this route. Alternatively, accept the services of one of the many touts in the terminal who will organise your ticket, arrange your passport copies and travel permission, and take you to the correct bus. The journey takes around 5 hours and the bus is a comfortable AC coach. Once at Al Gadaref bus station take a microbus to the souk (2SDG) and stay overnight at one of the hotels in the city centre (100SDG for two bed private room, shared bucket showers). Leave early the next morning and take a microbus or walk to the Gallabad direction bus station, which is different to the one you arrived at (N14.024227, E35.395183). Take a bus to the border town of Gallabad (36SDG). The border crossing process involves visiting the police office to register your arrival at Gallabad, then the Sudanese immigration office to register your departure, then the Sudanese customs office. You then walk across the border and visit the Ethiopian immigration office and the Ethiopian customs office. You will be approached by touts offering to change money and direct you to the various offices. This is not necessary since each office will direct you to the next, and there are banks for changing money on the Ethiopian side. Once in Ethiopia, buses for various destinations depart from a bus station around 3km up the road (not 7km as you will be informed). A rickshaw costs 10ETB or walk. From the bus station take a bus to Gondar (100ETB) or Metema. Ethiopian Airlines is the sole operator and has fairly comprehensive domestic services and network. Flights are often overbooked and schedule adjustment occurs frequently, so show up at the airport on time! As of 2017 you don't need to reconfirm but if you have one give Ethiopian Airlines your mobile number. They will text updates. Planes often suddenly show as due to depart early and then don't leave for hours after they are supposed to! There is a comprehensive network of cheap buses along the major roads, although these are slow and basic. Buses travelling shorter distances generally leave whenever they have filled up with passengers (in practice, this means once an hour or so); nearly all long-distance buses leave at dawn (06:00, and 12 o'clock according to the Ethiopian way of reckoning time). Buses do not travel at night; they will stop before sundown in a town or village with accommodation for the passengers, or, between Dire Dawa and Djibouti, by the roadside in the country. Between some cities (e.g. Adama and Addis Ababa), minibuses will run after the larger buses have stopped for the night. Everyone on the bus must have a seat by law -- this prevents overcrowding, but often makes it difficult to catch a bus from an intermediate point on a route. If planning to travel by bus, keep in mind that the vehicles are old and very dusty and the roads are bad. Ethiopians do not like opening the bus windows, so it gets hot and stuffy inside by afternoon. If you like fresh air, sit as close to the driver or one of the doors as possible as the driver keeps his window open and the conductor and his assistant often have the door windows open. The bus stations usually open somewhere around 05:00. If you are catching an early morning bus, you should get to the station at 05:00. They are very chaotic first thing in the morning, and many buses will sell out of seats before they leave at 06:00. To make things easier and less stressful, you can often buy a ticket in advance. In Addis, find the correct window at the bus station the day before you wish to travel and buy your ticket there. (You will need help finding the window unless you can read Amharic, but there are usually people around who will help if you ask.) The ticket will be in Amharic, but there will be a legible bus number written on it somewhere. Simply find that bus the next morning at the bus station. In smaller cities, you can often buy your ticket from the conductor when the bus arrives from its previous trip the afternoon before you travel. Even if you already have a ticket, arrive early and claim a seat as soon as possible. If you don't have a ticket, you will have to ask people to show you the correct bus, unless you can read Amharic. In this case, don't waste time trying to buy a ticket from the window or from the bus conductor: push your way on board the bus and claim a seat! The conductor will sell you a ticket later. Medium sized backpacks can usually be squeezed under the seats, but large packs and most luggage will have to go up on the roof. Claim your seat before you worry about your luggage. Anyone assisting you with your luggage, including the person passing it up to the conductor's assistant on the roof, will expect a small tip (around 2-3 birr but as a Faranji, you won't get away with less than 10 birr, probably 30). On several routes (Addis - Dire Dawa, Bahardar - Addis) you may find informal traveler cars with no fixed departure; when looking around at a bus station you may be approached by somebody who offers you a faster connection via private car; this is more expensive than the normal bus but also much faster. You'll be handed a cell phone number to call to make an appointment. These cars may leave before sundown or travel even at night. In Bahir Dar watch out for a scammer calling himself Danny. He'll walk you to a gleaming minibus (probably not his own!) take a 100 birr deposit and agree to pick you up to take you to Lalibela the next day. What will actually happen is some bloke (not Danny, he's long gone) will meet you, stick you on a bajaj and then put you on a local bus! The scammer will tell you that the bridge is broken, by sheer coincidence in Gashena where you usually need to change for Lalibela! However it seems I was just in time for the only direct bus to Lalibela. (The bridge miraculously repaired itself!) Upshot is you pay about 600 birr for a fare that would be pennies to to the locals and spend 10 VERY uncomfortable hours! A good way to tour Ethiopia is by car. You can take small airplanes to expedite your tour, but you will take in more of scenery if you travel by car. Reasonable touring companies include Galaxy Express Services, [www.south-expedition.com NTO], Dinknesh, Focus Tours Ethiopia, Ethiopia Safaris and Journeys Abyssinia with Zawdu, Gamo Travel (specializing in southern Ethiopia)  and Ecotravel Ethiopia ☎ ++251 (0) 911-440-915" . They can take you off the beaten track so you can see the beauty and attractions of Ethiopia. Nevertheless, hiring a car is quite expensive (starting from 600-900 birr depending on condition and quality of model. 600 Birr for cheap car with driver). But if you want a car for at least 8 persons it costs from 1000-3000 Birr per day. Prices will vary due to inflation. Drivers pass on their costs for spare parts and need to increase the price if fuel rises. A driver guide's credentials should be checked such as tourism license, insurance, engine (external and internal). Before accepting a contract, it is also a good idea to quiz the driver-guide about tourism routes via your own travel guide book (ie Lonely planet and Bradt Guide) but you must also accept that this information could be out of date. When driving to the "deep south" of Ethiopia also check the license plates, because the authorities in the south check in and log "3" plate tourism cars, take the names of the passengers and passport number. They need a letter from the tour company to show the agent is bona fide on some routes and parks. Gas comes at 21 birr a litre. Make sure to always check how much gas is bought and to get a receipt after filling up the gas, or you might be overcharged. Road conditions vary considerably around Ethiopia; some roads are smoothly sealed while others consist mostly of large stones. Accommodation is cheap and available in almost every village (although these "hotels" usually double as bars and brothels). Food and drink are also easily available. You will attract considerable attention (it is not uncommon for whole schools to empty out as the children chase you). Ethiopia is undergoing a vast modernisation of its railways, with significant Chinese, Turkish and Brazilian investment. A new electric standard-gauge railway has recently been built from Addis Ababa to Djibouti; limited freight operations commenced on the line in 2015. The line fully opened in October 2016, and started carrying passengers in January 2018. The line includes stops at Adama, Awash, Dire Dawa and Ali Sabieh, among others. EDIT: As of July 2017 there is still no timetable or information. Probably be the end of the Wet Season before any announcement is made. Two other railways are currently under construction - these will link Mek'ele with Awash and Addis Ababa with Bedele. In addition, a light rail network - also constructed by the Chinese - runs in Addis Ababa. Amharic is the first official language of Ethiopia. The language is a Semitic language related to Hebrew, Arabic and Maltese, and if you know any of these languages you'll recognize some cognates. In all parts of the country everyone speaks Amharic to some extent, no matter what their first language may be. The language is written in the Ge'ez script. English is the primary foreign language taught in schools, and is medium of secondary school education. In big cities, most people under 40 speak some English. In rural areas, find local school children to translate for you for a fee that could be next to nothing. Ethiopians have a distinct way of speaking English. Because it is heavily accented, it might be a bit difficult to understand it at the beginning. However, when you get used to the way they pronounce some English words, it will become fairly understandable. Up north in Tigray, Tigrinya is the primary language, and it's also written in Ge'ez. However, Amharic is widely understood. In the middle regions, Oromo (http://en.wikipedia.org/wiki/Oromo_people) is widely spoken. Oromo language uses a Latin alphabet. Go trekking in Bale Mountains, and Simien Mountains National Parks. While getting the glimpse of the red fox is a fortunate experience in the mountains, they offer one of the most spectacular landscapes, beautiful vistas and a thrilling experience of trekking at above 4000m. As you can see from the picture on top of this page, trekking over the Geralta mountains' range allows you to watch one of the most spectacular landscapes in Africa. Enjoy bird watching at the Rift Valley lakes and white water rafting on the Omo River. See the Azmari-bet(traditional dance) in Bahir Dar, Dessie and other cities; attend the traditional coffee ceremony. A tour around Southern Ethiopia will allow you to experience the lifestyles of ancient tribes and local nature. In Arba Minch, you can take a boat trip on Lake Chamo and see the crocs, hippos and pelicans and visit the 40 natural springs. Cross the bridge of the god (a natural bridge dividing two lakes) to the local savannah and stand amongst the zebras. Close by Arba Minch, you can visit the mountain villages of Dorze and Chencha where you can visit the traditional markets, visit the homes of potters and weavers and enjoy treks through the pleasant green countryside. Arba Minch is also the gateway to Omo Valley where you can visit local tribes and see their local ways of life, for example, attend the traditional bull jumping ceremony with the Hamer tribe. The official currency is the Ethiopian birr (ETB). You are only supposed to import and export 100 birr. Cash transaction is still the norm, although credit cards (Visa & Mastercard) are becoming more widely accepted in mid & high-level hotels and service providers such as travel agency. Vendors' credit card machined do not work most of the time so you'll need to pay cash instead. €1 = ~25 birr and USD1 = ~20 birr as of January 2015. Coins are available in 1, 5, 10, 25, 50-cents and 1-birr denominations, and banknotes come in values of 1, 5, 10, 50, and 100 birr. If you have Visa or MasterCard-affiliated debit card you are able to withdraw cash from most ATMs around the country (max withdrawl is 4,000birr). Plus-network connected cards are only accepted at Wegagaen Bank's ATMs. ATMs are available in most places tourists visit (except the Simien Mountains) however Visa-connected cards remain the most easily accepted cards. Lalibela's ATMs don't seem to accept foreign cards for some reason. Just go into Dashen Bank and pay a 1.5% commission. Any major bank branch in Ethiopia can change foreign currency into Ethiopian Birr. The rates are the same everywhere. There are dozens of commercial banks in Addis, including in the Sheraton and Hilton hotels, and in the corner of the baggage claim hall at the airport. Most cities and towns that tourists visit will have at least one commercial bank, except for villages in the Omo valley. US dollars, euros, or British pounds are the best currencies to carry. It is illegal to change money on the black market although the rates are about 10% better than what you can get from the banks (USD1 = 28 birr Jan 2019). If you change money officially, it's imperative to keep all the exchange slips in case you want to re-convert any left-over Birr back into foreign currency. However, bear in mind that changing money back into foreign hard currency is not easy and you need to go to a branch of the Commercial Bank of Ethiopian in a major city. Leaving from Bole International Airport in Addis Ababa, only Dashan Bank (airside of Terminal 2 next to immigration at arrivals, two floors below the departure lounge) changes birr back into foreign currency. However, you would need a receipt from Dashan Bank showing the original conversion into birr. As Birr has the tendency to be devaluated over time, change/withdraw from ATM what you need on a regular basis instead of change a large stash of cash. Ethiopia is relatively cheap for tourists, compared to other African countries. Injera is Ethiopia's national dish. It is a spongy, tangy-tasting sourdough made from the grain teff, which grows in the highlands of Ethiopia. It is baked in the form of giant thin pancakes, then often rolled up and sliced to hand-sized portions. It is eaten with wot (or wat), traditional stews made with spices and meat or legumes. Some popular wats are doro (chicken) wat, yebeg (lamb) wat and asa (fish) wat. Most dishes are somewhat spicy, but still very enjoyable for western travellers. At the same time probably the long cooking times of stews will leave you with minimal food-related problems compared to other low developed countries. The injera sits directly on a large round plate or tray and is covered with wat placed symmetrically around a central item. The various wats are eaten with other pieces of injera, which are served on a side plate or come free of charge once you finished the non vegetable covered injera on the main plate. Injera is eaten with the right hand - rip a large piece of injera and use it to pick up one of the various flavours of wat on the main platter. Do not eat with your left hand! In Ethiopia food is a respected gift from God and eating with your left hand is a sign of disrespect. Another popular injera dish is firfir: fried, shredded injera. It can be served with or without meat or with all sorts of veggies. If you prefer vegetarian food, try the shiro wat, which is a chick-pea based stew served with injera. Most times you have to specifically ask for vegetarian options as it doesn't come with most of the combinations since Ethiopians prefer meat. When a vegetarian is having trouble communicating his/her dietary needs, a good strategy is to ask for "fasting food," a concept that is nearly universally understood. The Ethiopian Orthodox Church mandates a large number of "fast days" during the year - officially more than 180 days annually, including a 56 day fast during the Orthodox Lent. During these periods, the observant are required to eat no animal products, only vegan food. In large tourist restaurants in Addis and in predominately Muslim areas, you will find the fasting period has no impact on the food available to you. But in smaller restaurants, including in tourist venues like Lalibela and Axum, a tourist will be handed an English language menu full of chicken and meat options - but when attempting to order those items, will be told they are not available, and given the option of "fasting food." The result will be a very tasty injera plate with 3-6 vegetable and legume wats, including lentils, spinach/greens and similar items. While this can be frustrating to carnivores, and the be served the same "fasting food" for days on end can become tiresome, it makes Ethiopia much more vegetarian friendly. For those that require gluten-free dietary the teff-based and therefore gluten-free injera will make you love the country. Another popular dish is tibbs or tibs, spicy beef fried in butter. It can be either really bad (burnt to a crisp and resembling petrified wood) or juicy and delicious in more fancy restaurants. (The Holiday Hotel in Addis serves delicious tibbs). Kitfo is minced meat, spiced with chili. You can have it raw (the locally preferred way, but there's a risk of getting tape worm), leb-leb (lightly cooked) or fully cooked. It comes with a local cheese ayeb and a spinach. The legal drinking/purchasing age of alcoholic beverages is 18. The coffee ceremony involves drinking a minimum of three cups of coffee and eating popcorn. It is a special honour, or mark of respect to be invited into somebody's home for the coffee ceremony. In preparation for the ceremony the coffee beans are roasted in a flat pan over charcoal. The beans are then ground using pestle and mortar. The coffee is brewed with water in a clay coffee pot and is considered ready when it starts to boil. Coffee in Ethiopia is served black with sugar. Tej is a honey wine, similar to mead, that is frequently drunk in bars, in particular, in a tejbeit (tej bar). A variety of Ethiopian beers are available, all of which are quite drinkable; also Ethiopian wines, both red and white, which would not win any prizes but are drinkable. There is a wide range of accommodation in Ethiopia. There is a luxurious Sheraton hotel in Addis Ababa. You can also find a "hotel" that is nothing more than a small room with a tiny bed, and no running water, in the border town of Moyale. Staying in tourist areas generally results in a broader range of choices, but watch out for tourist prices. It is acceptable to bargain with the hotel owner, for they usually tend to charge you "faranji" (foreigner) prices at first, which are often twenty times the local rate. You won't be able to bargain down to local prices (close to nothing) but you can bargain down a lot. This is not true at the government run Ghion chain, and the fancier private chains as well, where prices for foreigners are fixed (Bekale Mola, for example). Addis: Addis is full of cheap hotels. Most tourists stay in the piazza area, where there are many hotels ranging from very cheap to moderately cheap. Except for the cheapest, most of them have running hot water, and are fairly clean. Park Hotel starts at 20 birr a single and 30 birr a double. Two big ones are Taitu hotel and Wutma hotel. The two biggest hotels in Addis are the Sheraton, referred to by expats as "The Sheza", and the Hilton. Both are enormous and very expensive. Both have swimming pools, good restaurants, souvenir shops and bakeries: the rooms are comfortable. If you cannot afford these two hotels, visit them and chat up the expats (especially at lunch time when they take their break by the pool) and if your accommodation needs to be improved, they might be able to help out. You might also catch a glimpse of a rich or famous celebrity or high powered world politician, who is in Addis to do some charity work or to deal with some sort of African politics. To escape from the busy capital, many foreign residents escape now in the weekend to Debre Zeit, at only 50km. With 7 crater lakes and a nice climate, by which you can sit outside, day and night, the whole year, Debre Zeit gets the place to be. The new highway from the Addis will link Debre Zeit in 25 minutes. Most scenic are Babogaya Lake and the Green crater Lake. At Babogaya Lake, Viewpoint Lodge offers an amazing view, very good value, and the lake water is used for swimming by many people. Green crater lake, behind the militairy airport, offers a deep hole of 150m, in which you can go down. In the north, in every city (Axum, Lalibella, Bahir Dar, Gondar) one can find hotels, from overpriced ones such as the government-run Ghion chain hotels to cheaper ones. Smaller places on the major roads offer cheap places if you do not mind the most basic rooms. A tourist town like Debark that serves for trekking the Simien Mountains also offers a range of rooms, with the most popular being the Simien Park Hotel (25/30 birr), where you could also pitch a tent for 20. It meets the normal standards for food, electricity, water, cleanliness and hygiene. In the south, all the cities (Shashemane, Wondo Genet, Awasa, Arba Minch, Jinka...) have decent, cheap hotels. The most basic rooms start at 15 birr for a single and 20 birr for a double. Many of them don't have hot water and electricity all hours of the day, so you should schedule time for a shower in advance. There are also three fairly expensive resort hotels on the shore of Lake Langano. In the smaller villages in and around the Omo valley (Weyto, Turmi, Key Afar, Dimeka, Konso, etc.) there are usually few (very basic) or no hotels, but if you are travelling through the valley to see the tribes, there is always a campground or a restaurant that offers beds. If you camp out at one of these villages, you should hire a guard to watch over your stuff overnight. Ethiopia has one of the lowest unemployment rates in Africa. The unemployment rate is 5% (2005). Notice that the average income is about 120 US-dollar/month per inhabitant. There is a high demand of IT professionals. Addis-Ababa has the highest number of NGOs in Africa, and possibly among all Third World countries. They are famous for providing generous salaries to their employees. Compared with other African cities, Addis-Ababa has a high number of big, medium and small sized computer training schools, and governmental and private learning institutions. Many students who attend hope to obtain an IT or consulting job, in the very scarce job market of the city. There are many opportunities to volunteer in and around Addis Ababa. Organizations such as Love Volunteers  and Projects Abroad  offer a range of volunteer projects including teaching English, caring for children and healthcare. Ethiopia is a relatively low-crime country compared to Kenya, South Africa and some other countries in Africa. Avoid traveling to the eastern part of the country beyond the city of Harar. Somali separatist groups occasionally launch guerilla attacks. Most expats who go there are US military personnel actively training the Ethiopian army's anti-terrorism unit. Many others are Chinese, Indian or Malaysian representatives of oil companies, who have been targeted in major guerilla attacks resulting in dozens of casualties. Armed insurgent groups operate in the Oromiya and Afar regions. In 2008, a hotel in the town of Jijiga and two hotels in the town of Negele Borena were bombed. In October 2013, a bomb planted by terrorists killed two people in Addis Ababa. In November 2013, it was rumored that terrorist groups are planning new attacks in Addis Ababa and other parts of Ethiopia, making further attacks more likely. On 11 December 2015 an explosion at the Anwar Mosque in the Merkato area of central Addis Ababa wounded several people. Organized crime and gang violence are very unusual in most parts of the country. However, in the border areas of Sudan (Gambella Region) and Kenya, there are reports indicating occurrences of banditry. Avoid these areas. Though Ethiopia has a secular government, the people are very religious. The two dominant religions (the Ethiopian Orthodox Church and Islam) strongly influence day-to-day life. Due to their influence the government implements certain rules and laws that could appear unsettling to westerners. Compared to other African countries, robbery is not a major problem in the cities and towns. However, travelers are advised to look after their belongings. Travelers should be cautious at all times when traveling on roads in Ethiopia. There have been reports of highway robbery, including carjacking, by armed bandits outside urban areas. Some incidents have been accompanied by violence. Travelers are cautioned to limit road travel outside major towns or cities to daylight hours and travel in convoys, if possible. Travellers with vehicles and cyclists may often be the target of stoning by local youths when driving in rural areas. Outside of Addis, you will likely encounter many children who will approach you and ask for money. The greeting "Hello money" is a common one. A typical scam is to ask you to purchase a dictionary for their school, which the overpriced tourist shops just happen to carry for $50 each - this is a scam. You may feel awful to ignore these kids (especially those who grew up in the West and remember the 1990's famine post-Derg). Many will tell stories about coming from the countryside and having to pay their own schooling, or not having shoes. While they are undoubtedly poor, these are lies to try to trick you into giving them money that they can spend on buying a material good instead of life necessity. If a child tries one of these schemes on you, do not hesitate to politely tell them that you cannot give them any money since it will just encourage them to tell lies instead of growing up to be an honorable person. Ethiopia is a socialized state where almost all of the basic necessities of life are provided. For sure the children who approach you are poor, but they do have free education, housing, clothing, and meals; typically they are just looking for a way to make some extra money to buy a football jersey or some other material good to show off to their friends. The adults on the other hand are very kind and friendly, and frown upon this behavior from their own kids but cannot stop it. After being denied money, children will typically ask for a donation of clothing with a very sad puppy-dog face (unless you are wearing a football jersey, they will ask straight up if they can have this - not out of need, but materialistic desire). There are conflicting opinions on whether to give even clothing: one faction believes that bringing your old clothing donations from home are a win-win, since going to a good cause. The other faction believes that this only encourages children to keep begging instead of leading an honest life, and they would only take your shirt and sell it in the market for money to buy a material good (football jerseys are especially the hot item among kids). One thing you can be sure to donate without any negative repercussion is food. Prostitution is legal, but be careful not go in places that are brothels. Brothels are illegal, and there are the possibility of police raids. Do not interact with prostitutes that are below the legal age of consent, punishments are severe. Also be aware of those with HIV/AIDS, even though in Ethiopia, it is a small risk. Homosexuality is illegal in Ethiopia and isn't tolerated: penalties are harsh and can include imprisonment up to 10 years. Be careful of the food you eat, and don't stay in the sun too long. If you get sick, go to one of the big private hospitals, eg. Korean, Hayat, St Gabriels. Do not drink tap water. Bottled water for drinking is available almost everywhere in small, medium and big bottles. Addis tap water is better than in many other cities, but even the hotels generally recommend that guests do not drink it, nor eat salads or other uncooked food that is commonly washed in tap water. However, do make sure you drink enough water, especially when the weather is hot. Consult a doctor before going to Ethiopia and stock up on prescription drugs you require. The risk of malaria is low in the capital and the highlands, but high in the lake regions and lowlands. Doxycycline for malaria prevention is cheap in Addis. Ethiopians are very proud of their culture, identity, and country. Avoid criticizing their cultural lifestyle, especially their brand of Christianity (Oriental Orthodox). Avoid all contentious religious discussion, or you may risk all good will and hospitality you could have been afforded. Rather than argue about the merits of Orthodoxy or Islam, it's best to ask friends to explain their customs, festivals and beliefs and to listen with respect. The Ethiopians' relationship with the Westerners is generally free of racial animosity. However, there is considerable suspicion and even xenophobia toward foreigners in the countryside. Ethiopians can be short-fused if they feel they are not treated as equals. If a woman is with a man, ask the man's permission to talk to her beforehand. For a man to avoid eye contact with a woman is considered a sign of respect. If you're a foreign woman and are in public with a man, don't be upset if Ethiopian men address all questions to him. They will do this not to slight you but to show respect. This will be the case on public transport and in restaurants. Likewise, if you are a foreign man, maintaining a formal distance from women will be seen as good manners. It is very important that you remove your shoes when entering a home. The country code for calling Ethiopia is 251. The Ethiopian dialing plan changed on 17 September 2005, such that the two-digit city code changed to three digits (or, from outside the country, one to two digits) and six-digit telephone numbers changed to seven digits. The city code for Addis Ababa, as of 17 Sep 2005, is 011 (or 11 from outside Ethiopia). An on-line telephone number converter, which will convert an old number to the new number, is available here: . Ethiopia uses GSM (as in Europe/Africa), operated by Ethiopian Telecommunications Corporation (ETC) and limited 3G. Currently there is decent coverage around the big cities such as Addis Ababa, Dire Dawa, Adama, Bahir Dar, Awasa, Harar, Dese, Gonder, Mekele, and Nekemete. It is expanding into small cities. For all travellers, having a mobile phone is a must. It is cheap and easily available. There are only few stores that rent SIM cards: you can rent a SIM card and phone inside the Addis Ababa Sheraton hotel but is it very expensive. Your best option is to a rent a SIM card and mobile phone from a local store. You can also buy a SIM card from many local stores (try anywhere that sells phones). You will have to give the seller a copy of your passport ID page, 2 passport style pictures, and 40 birr (as of 20/03/2010). You'll have to sign an agreement that you will not commit any crimes with your phone. All local stores will have calling cards you can purchase to call internationally. Other places to rent SIM cards or phones include ArifMobile which offers additional services with their SIMs. Roaming charges are very steep. For a short visit, your best option for mobile access is to rent a SIM card with a phone. While roaming arrangements are said to be in place in practice you may find it impossible to get a connection that works reliably, or at all. There are numerous internet cafes in Addis Ababa, Dire Dawa, Nazret, Bahir Dar, Gonder, Awasa and other cities. In Addis Ababa, connection speeds are more than adequate for performing tasks such as checking e-mail most of the time. A typical internet cafe will have a dozen computers using one broadband (usually starts from 128kbps) connection. Ethiopia's international connection is unstable: On bad days, even a broadband connection will only deliver dial-up speed, because the whole country's traffic is running via an undersized backup satellite connection. To use the internet costs between 25-35 Ethiopian cents/per min in the bigger cities but outside the cities it usually costs more than 1 birr/per minutes. Most of the computers have USB, so maybe you'll be interested in using a portable e-mail program (like Thunderbird portable) from an USB-stick. Take care of computer viruses! Most computers or flash disks in use are infected. Outside of bigger towns, it is harder to find a working Internet connection and the charge per minute is often much higher than in bigger towns. Ethiopia is currently in the process of deploying an internet filter; to access blocked sites, use a VPN or use the free, open-source TOR Project. Following an international outcry, a new law that appeared to ban the use of Skype and other VOIP services has been replaced. Personal use of VoIP services such as Skype has been legalised as of July 2012. At the beginning of April 2018, WhatsApp was blocked (not Skype), but a VPN app enabled me to easily phone and chat with my family and friends using my mobile phone. I used Hi VPN for that. This page was last edited on 19 April 2019, at 20:28.